Euthanasia (“good death”) is the practice of intentionally ending a life in order to relieve pain and suffering. It is also known as ‘mercy killing’. In many countries, there is a divisive public controversy over the moral, ethical, and legal issues of euthanasia. Euthanasia is categorized in different ways, which include voluntary, non-voluntary, or involuntary. Euthanasia is also classified into active and passive Euthanasia. Voluntary euthanasia: Euthanasia conducted with the consent of the patient is termed voluntary euthanasia. Voluntary euthanasia is legal in some countries. Jurisdictions, where euthanasia is legal, include the Netherlands, Colombia, Belgium and Luxembourg. Non-Voluntary euthanasia: Euthanasia conducted where the consent of the patient is unavailable is termed non-voluntary euthanasia. Non-voluntary euthanasia is illegal in all countries. Examples include child euthanasia, which is illegal worldwide but decriminalised under certain specific circumstances in the Netherlands under the Groningen Protocol. Involuntary euthanasia: Eutanasia conducted against the will of the patient is termed involuntary euthanasia. Involuntary euthanasia is usually considered murder. Voluntary, non-voluntary and involuntary euthanasia can all be further divided into passive or active variants. Passive euthanasia entails the withholding of common treatments, such as antibiotics, necessary for the continuance of life. permitting euthanasia will not necessarily lead to unacceptable consequences. Pro-euthanasia activists often point to countries like the Netherlands and Belgium, and states like Oregon, where euthanasia has been legalized, to argue that it is mostly unproblematic. Constitution of India: ‘Right to life’ is a natural right embodied in Article 21 but euthanasia/suicide is an unnatural termination or extinction of life and, therefore, incompatible and inconsistent with the concept of ‘right to life’. It is the duty of the State to protect life and the physician’s duty to provide care and not to harm patients. Supreme Court in Gian Kaur Case 1996 has held that the right to life under Article 21 does not include the right to die. Caregivers burden: Right-to-die‘ supporters argue that people who have an incurable, degenerative, disabling or debilitating condition should be allowed to die in dignity. This argument is further defended for those, who have chronic debilitating illness even though it is not terminal such as severe mental illness. The majority of such petitions are filed by the sufferers or family members or their caretakers. The caregiver’s burden is huge and cuts across various domains such as financial, emotional, time, physical, mental and social. Refusing care: Right to refuse medical treatment is well recognised in law, including medical treatment that sustains or prolongs life. For example, a patient suffering from blood cancer can refuse treatment or deny feeds through a nasogastric tube. Recognition of the right to refuse treatment gives a way for passive euthanasia. Encouraging the organ transplantation: Euthanasia in terminally ill patients provides an opportunity to advocate for organ donation. This, in turn, will help many patients with organ failure waiting for transplantation. Not only euthanasia gives ‘Right to die‘ for the terminally ill, but also ‘Right to life‘ for the organ needy patients. Euthanasia weakens society’s respect for the sanctity of life. Euthanasia might not be in a person’s best interests, for example, getting old aged parents killed for property will. Belief in God’s miracle of curing the terminally ill. Prospect of a discovery of the possible cure for the disease in near future. Proper palliative care makes euthanasia unnecessary. There is no way of properly regulating euthanasia. Allowing euthanasia will lead to less good care for the terminally ill. Allowing euthanasia undermines the commitment of doctors and nurses to saving lives. Euthanasia may become a cost-effective way to treat the terminally ill. Allowing euthanasia will discourage the search for new cures and treatments for the terminally. ill.
Euthanasia gives too much power to doctors. Passive euthanasia is legal in India. On 7 March 2011, the Supreme Court of India legalised passive euthanasia by means of the withdrawal of life support to patients in a permanent vegetative state. The decision was made as part of the verdict in a case involving Aruna Shanbaug, who had been in a Persistent Vegetative State (PVS) for 42 years until her death in 2015. The brain-dead for whom the ventilator can be switched off. Those in a Persistent Vegetative State (PVS) for whom the feed can be tapered out and pain-managing palliatives be added, according to laid-down international specifications. The same judgement-law also asked for the scrapping of 309, the code which penalises those who survive suicide-attempts. In December 2014, the Government of India declared its intention to do so. However on 25 February 2014, a three-judge bench of Supreme Court of India had termed the judgment in the Aruna Shanbaug case to be ‘inconsistent in itself’ and has referred the issue of euthanasia to its five-judge Constitution bench on a PIL filed by Common Cause, which case is the basis of the current debate. Then, the CJI referred to an earlier Constitution Bench judgment which, in the Gian Kaur case, “did not express any binding view on the subject of euthanasia; rather it reiterated that the legislature would be the appropriate authority to bring change.” Though that judgment said the right to live with dignity under Article 21 was inclusive of the right to die with dignity, it did not arrive at a conclusion on the validity of euthanasia, be it active or passive. “So, the only judgment that holds the field with regard to euthanasia in India is the ruling in the Aruna Shanbaug case, which upholds the validity of passive euthanasia and lays down an elaborate procedure for executing the same on the wrong premise that the Constitution Bench in Gian Kaur had upheld the same,” the CJI said. On December 23, 2014, Government of India endorsed and re-validated the Passive Euthanasia judgement-law in a Press Release, after stating in the Rajya Sabha as follows: that The Hon’ble Supreme Court of India, while dismissing the plea for mercy killing in a particular case, laid down comprehensive guidelines to process cases relating to passive euthanasia. Thereafter, the matter of mercy killing was examined in consultation with the Ministry of Law and Justice and it has been decided that since the Hon’ble Supreme Court has already laid down the guidelines, these should be followed and treated as law in such cases. At present, there is no legislation on this subject and the judgment of the Hon’ble Supreme Court is binding on all. The court rejected active euthanasia by means of lethal injection. In the absence of a law regulating euthanasia in India, the court stated that its decision becomes the law of the land until the Indian parliament enacts a suitable law. 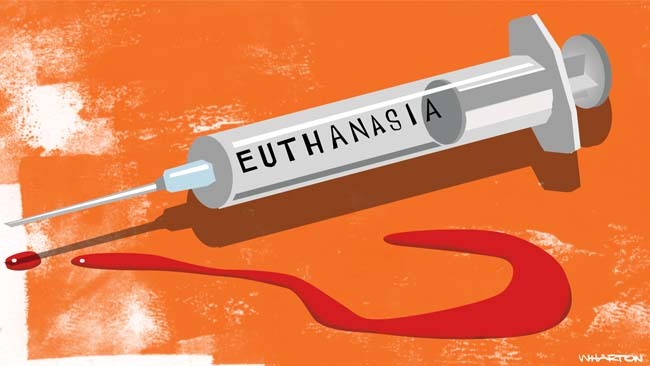 Active euthanasia, including the administration of lethal compounds for the purpose of ending life, is still illegal in India, and in most countries. A decision has to be taken to discontinue life support either by the parents or the spouse or other close relatives, or in the absence of any of them, such a decision can be taken even by a person or a body of persons acting as a next friend. It can also be taken by the doctors attending the patient. However, the decision should be taken bona fide in the best interest of the patient. Even if a decision is taken by the near relatives or doctors or next friend to withdraw life support, such a decision requires approval from the High Court concerned. When such an application is filled, the Chief Justice of the High Court should forthwith constitute a Bench of at least two Judges who should decide to grant approval or not. A committee of three reputed doctors to be nominated by the Bench, who will give a report regarding the condition of the patient. Before giving the verdict, a notice regarding the report should be given to the close relatives and the State. After hearing the parties, the High Court can give its verdict. Recently, the issue was in the news, as the Govt. said it was open to making a law on the subject. The law commission too has proposed a legislation on “passive euthanasia”, it said. According to the Centre, the decision to come out with a bill was taken after considering the directives of the apex court, the law commission’s 241st report and a private member bill introduced in Parliament in 2014. The Centre said that initially, a meeting was held under the chairmanship of B.P. Sharma, secretary in the health and family welfare ministry, on May 22, 2015, to examine the draft of The Medical Treatment of Terminally Ill Patients (Protection of Patients and Medical Practitioners) Bill and the draft of The Euthanasia (Regulation) Bill. Judicial activism: SC framing laws when the parliament hasn’t. Just like the Visaka case. Ethical dilemma in Paper 4. Giving passive euthanasia to a patient who is already dead (not literally) is a right choice.Its better than making them as well as others to suffer. If the patient does not wants to suffer and himself asking for euthanasia then voluntary euthanasia should be made legal because it will be difficult for him to live than to die. But in case of involuntary euthanasia, there should be some specific time limit upto which the patient’s relatives must wait for him to recover but if there is no improvement like in case of coma , after 7-10 years , there is less chances of the patient to recover. In such cases , involuntary euthanasia should be made legal. Helpful source I can use to rely on research. Thank you so much, clear IAS.